Green Bag Powder Mixed with Stopgap 114 or 128 Liquid. A fast setting, low odour, protein free floor smoothing underlayment. The cured product has a high strength making it suitable in areas subject to both light and heavy-duty traffic. The protein free composition makes it suitable for use in clinical and biologically sensitive areas. 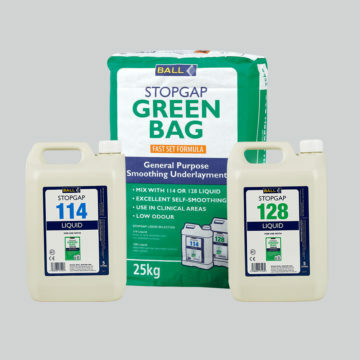 Stopgap Green Bag Powder is suitable for patch filling wooden floors prior to overpinning.